Acupuncture is a six-thousand year-old Chinese therapy that works by stimulating the body to naturally correct the imbalances of Qi. This is done by inserting ultra-fine, disposable needles underneath the skin at specific points in the body. These acupuncture points are related to energy pathways or meridians that run throughout the entire length of the body. 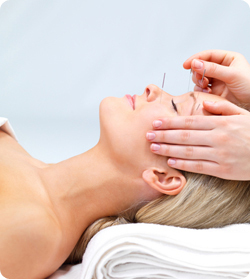 Acupuncture points are also related to specific internal organs. The earliest known text on acupuncture is the Nei Jing, or Classic of Internal Medicine, published more than 4,500 years ago. Reducing or eliminating pain. The body after being inserted with needles can produce Morphon like neuro-like chemical matter called endorphin which is an analgesic matter that reduces pain without the side effects of cortisone injections. Increasing immune system. Can be seen in T cell counts. Reducing spasm. Relieves and soothes muscles and allows the organ to relax so that you can treat diseases like fibromyalgia, asthma, abdominal cramps etc. Increasing the serotonin levels in your brain. Serotonin is the natural neurochemical transmitter. Low levels could cause depression or anxiety. Reducing inflammation. Could treat either bacterial/viral infections like bronchitis or aseptic infection like bursitis or tendonitis. Reducing histaimine. Could reduce the lgE level from the blood serum and so your allergy symptom like sinusitis or allergic dermatitis could improve. Copyright (c) 2010 DUNAMISACUPUNCTURE.COM. All rights reserved. Design by CSS Templates.